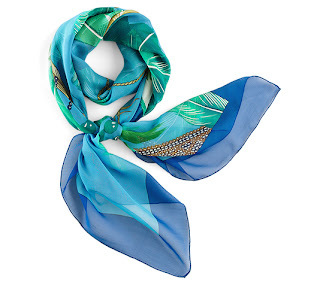 I'm seizing on two important events - the timid arrival of spring and the Canadian Federal elections - to feature a scarf that echoes the former in colour and the latter in spirit. 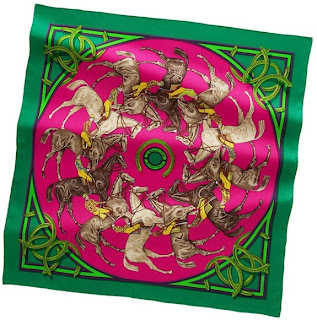 Concours d'etriers (Stirrup Contest) depicts many of the stirrups discovered by Emile Hermes from lands close and far-away, and diligently added to his personal collection, one of the many manifestations of his admiration of everything related to the noble horse. Another account of some of the stirrups was gracefully captured in the classic "Etriers" scarf that I featured on December 31st of 2009, so I won't insist on the items; instead, I thought it appropriate in light of the Canadian political parties undergoing a contest themselves, in which the de facto leader of the country - the Prime Minister - is to be chosen. 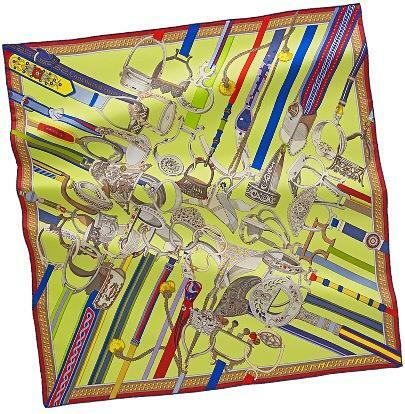 As a metaphor for the political landscape, the number of stirrups, and their proximity to each other, make it rather difficult to distinguish and appreciate the individual features and - hence - the beauty of each piece. That is because their number dazzles us; we train our eye to seek out the pieces that somehow stand out - the larger sizes or those of brighter or darker colours. Yet we must quickly develop a "plan of attack" to evaluate each item based on its own merits in order to pass an opinion on which one deserves the top prize - a difficult task, naturally ! Fortunately, the beauty of the collection rests not in the impressive number of items that makes it, but in every piece being carefully selected for its inner beauty - through his intense work and discriminate eye, the collector has done the evaluation for us, thereby helping us tremendously! The question is whether the Canadians will be as passionate and as discriminate as a true connoisseur to choose wisely. Finally, a word on the arrival of spring (or its hide-and-seek play). The trees in Toronto have finally bloomed (remember, it is May already!) and the sight is absolutely marvelous. The joy triggered by the rebirth of nature is without limits and I've been experiencing this sentiment fully over the last week. I can only imagine what the coming days will surprise us with ! 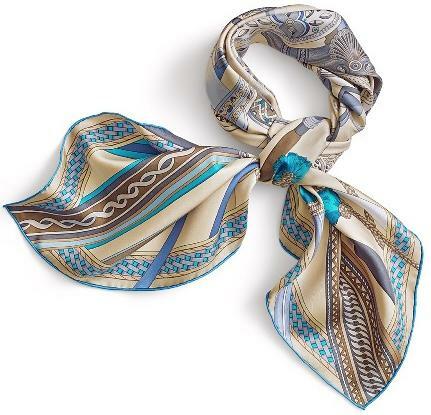 Until then, there's a wonderful surprise in this very scarf design: the way the scarf ties is unexpected and quite beautiful. Similar in spirit with the "Voyages en etoffes", perhaps the the most delicate example in this scarf is the one depicted below, with a combination of blues, cream and light brown for a truly magic effect. A lovely design originally released under the "Ascot 1831" name in 1969 before being reissued once before (AW2004) under its current "Jockeys Round" name. It illustrates twelve mounted jockeys transposed in such a way as to fit within a circle. I was drawn to this design by the very bright and vibrant colours that infuse a very young spirit into this traditional pattern (take, for instance, the knotted scarf below, whose baby blue and orange - one of my favourite combinations - give a young vibe despite the traditional pattern featured in each of the four corners). 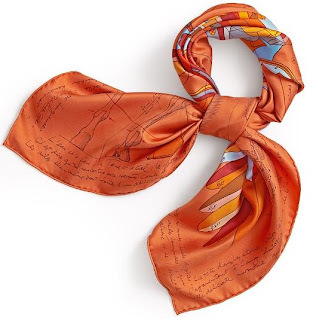 A memorable scarf that takes us on a nostalgia path to our childhood and rekindles the passion each of us had for collecting - stamps, rocks, hats, airplane models, and (naturally) cards. 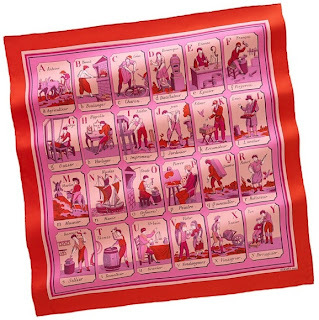 As a tribute both to our childhood pastime and to the artisans (the theme of this year's collection), Hermes has reissued "the Alphabet of Trades", illustrating the craftspeople and their trades, matching one of each for each of the twenty-four letters, such as: "Benoit is a baker" and "Pierre is a painter" (I invite you to find Hermes'). This design was launched in 1945, and reissued in 1991 before this year's three more colour combinations. This design renders the scarf a little traditional, although the many ways of wearing it can easily make is as contemporary as any other. 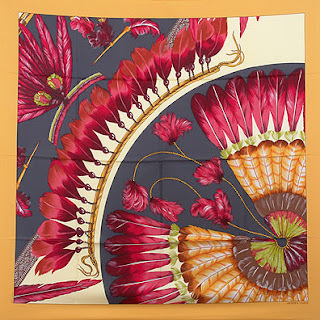 Long overdue is the charming "Brazil" design with its delicate feather-based gear inspired from the ornamentations of Amazonian Indians. 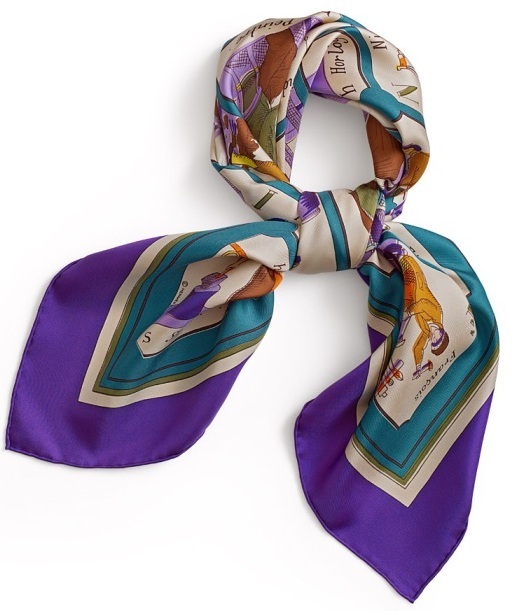 Today's post focuses on the reinterpretation of an older design, with a fresh scarf focusing on a close-up detail of the original. People's (and peoples') fascination with self-built gear is evident in the many cultures where adorning various body parts continues to be a central element of local cultures. As a species of the animal kingdom, man is the only "animal" lacking feathers or fur to protect its body from the weather's vicissitudes. First, we seek to cover our sexual organs. Yet, the drive to cover our bodies is not stemming from mere modesty. Since our birth (and the original creation), we sense that we're lacking something - something we end up seeking (often relentlessly) to make ourselves beautiful throughout our entire lives. As "naked apes", we have retained a single natural vestige that we - men and women alike - use to express grace, sensuality, seduction (think of a geisha's hair), as well as courage and virility (consider the military-style haircut). When expressing ourselves through a hair arrangement or haircut is no longer enough, we appeal to feathers as embellishments or, symbolically, as complements to our bodies, elements that we seize on to transform ourselves. The delicate feather becomes a powerful symbol of power, social position or courtship ritual. Nowhere is this more obvious than the peacock's giant fan, nothing short of a marvel of transformation, to signal its moods. 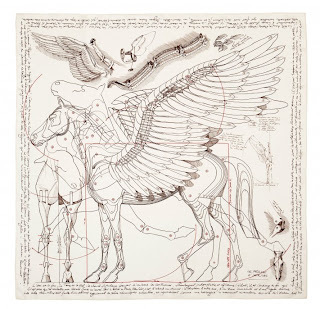 Continuing the review of the current season's creations is "Hermes' Pegasus", a fascinating scarf that catches the admirer's eye for two reasons: first, the remarkable rendition of juxtaposed equine drawings is reminiscent of Leonardo da Vinci's sketches intended to explore a subject thoroughly (and to the patron's satisfaction) before the artist began work on the actual canvas, marble or architectural construction. As we look at this drawing, a certain anticipation builds up, making us wonder what the actual creation - which undoubtedly must exist somewhere - looks like. This curiosity becomes our desire to learn more and to discover what intuition, inspiration, creative genius, skill and possible secrets the fruit of this passion entailed. And the canvas' power to elicit our curiosity is the second reason this design fascinates. The text along the four edges of the square tempts the admirer to pay attention to it, in the chance that it may reveal some of the secrets. It is the "other" window into the artist, his intimate thoughts, possible struggles and ingenious solutions. In a word, the writing elicits the desire to be read. 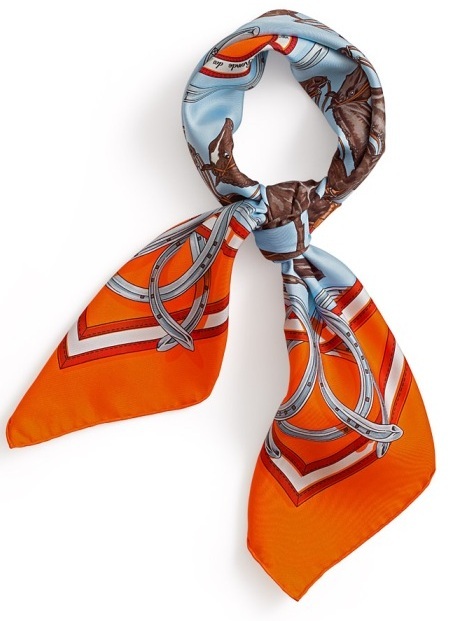 The choice of vibrant colour combinations (for the most part) renders the scarf very young and full of energy. 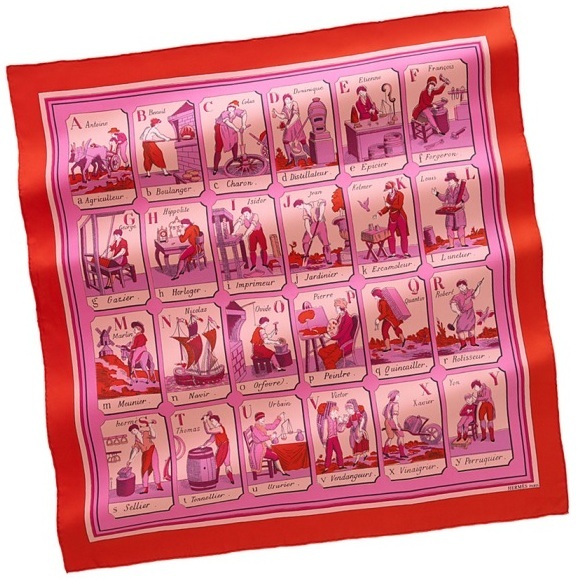 Select areas of the knotted scarf remind me of the "Le monde est vaste" design. 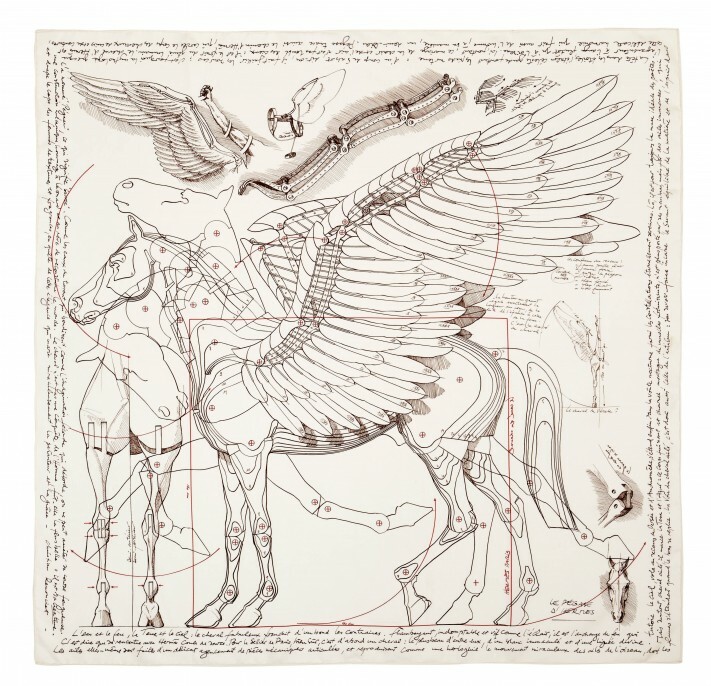 Yet the gracious lines of the drawings, unmistakably revealing a horse, assures the viewer that this design is new and deserves to be seen!